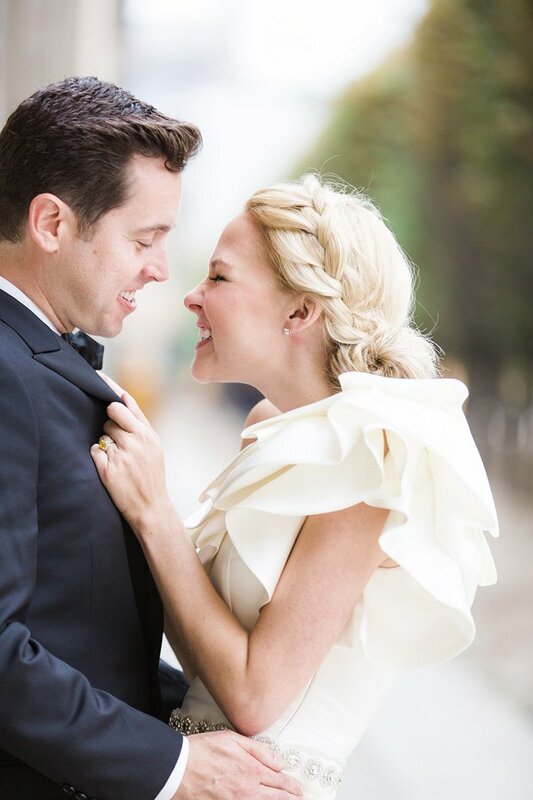 Would you do what this gorgeous couple, Josh and Burgess Scott did? 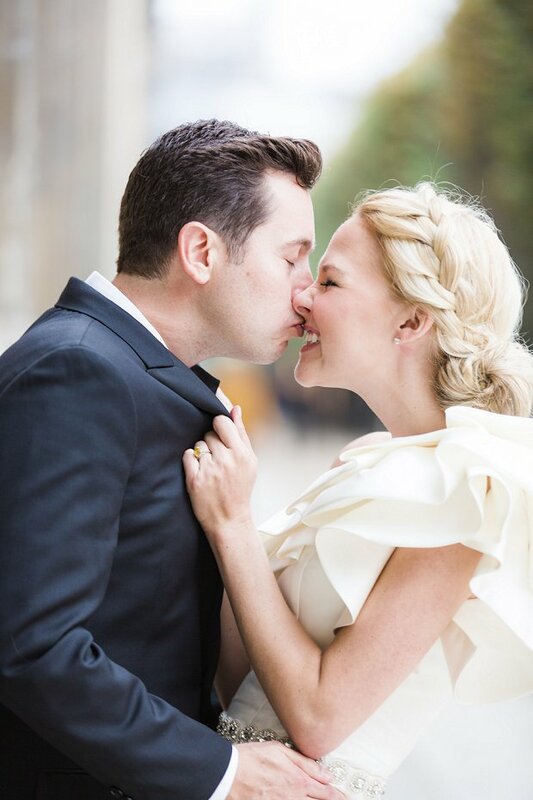 They threw caution to the wind and eloped in Paris! The result? 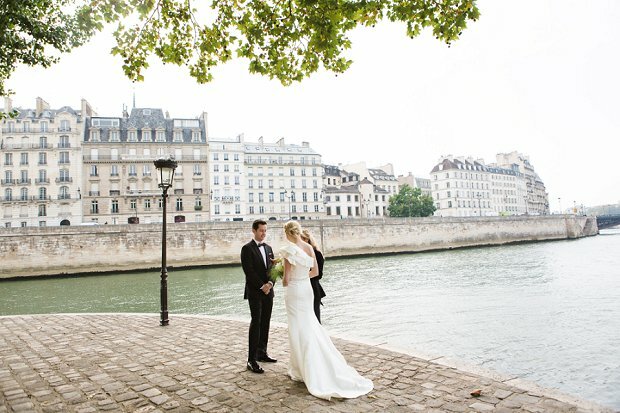 A magical, stress free ceremony beside the Seine. After many months of trying to plan a traditional wedding, we found ourselves becoming stressed over things that didn’t matter much to us. Josh asked me if I could have anything in the world what would I want for our wedding. 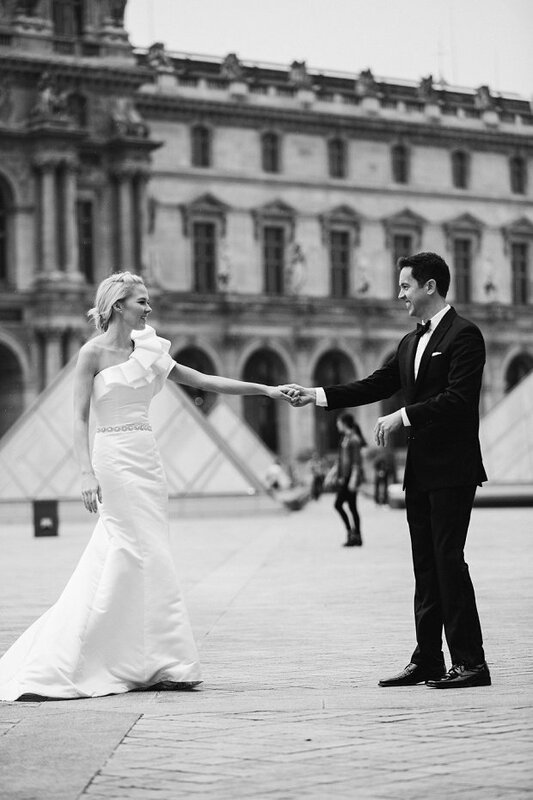 My answer came to me quickly: I wanted to get married in Paris. 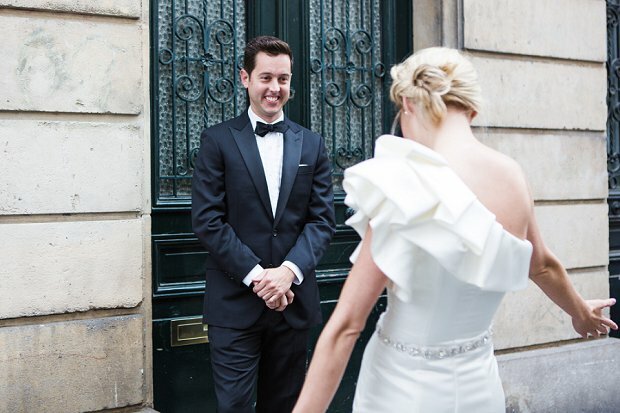 When I visited Paris the year prior, with my mother, I happened to see a bride and groom walking down the street together. It was such a romantic scene. 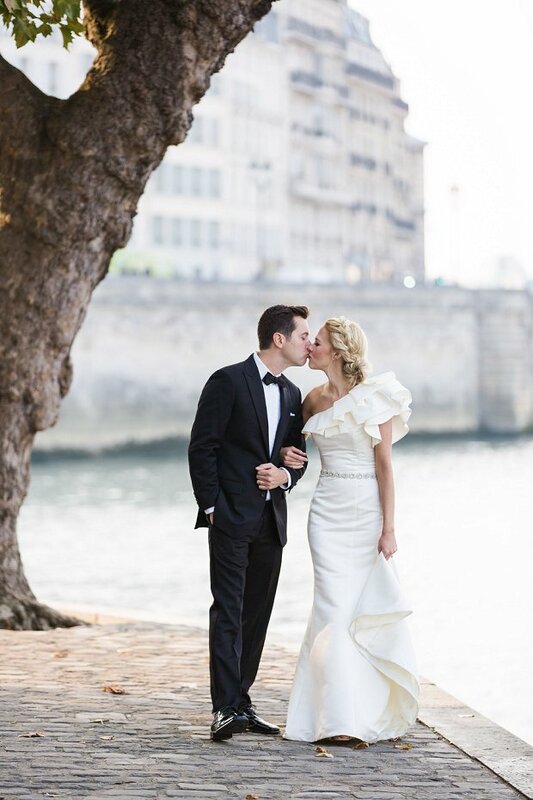 Josh and I planned everything ourselves and on September 24 we had our ceremony on the bank of the Seine at Place Louis Aragon on Ile Saint-Louis. 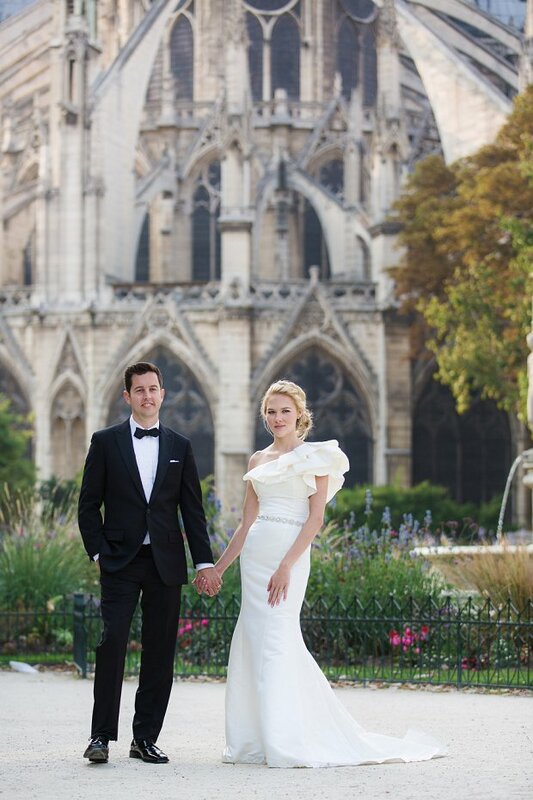 I wore an Ashley Lauren dress and belt as I loved the drama of the ruffle detail and thought the dress was structured enough to hold it’s own next to the Eiffel tower. 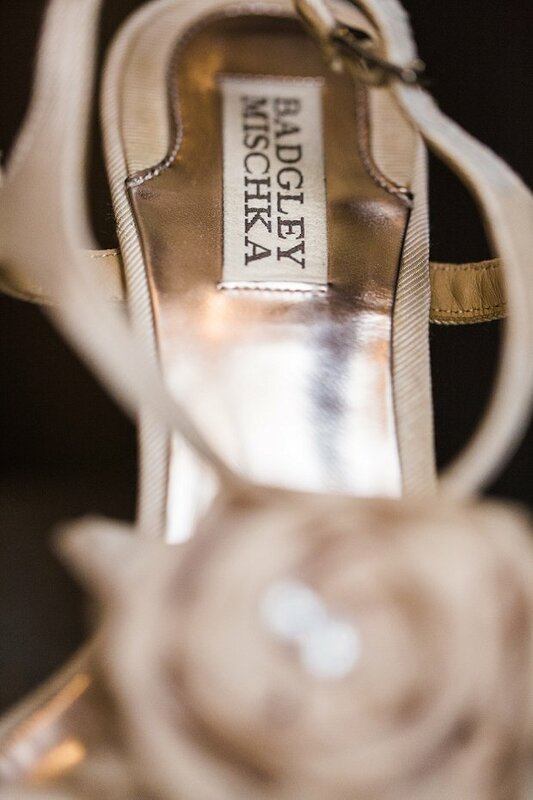 My beautiful shoes were Bagley Mischka. There was a flower shop right up the street from our hotel so I asked Catherine, our photographer, if we could pop in quickly to find some flowers before we headed to the ceremony. 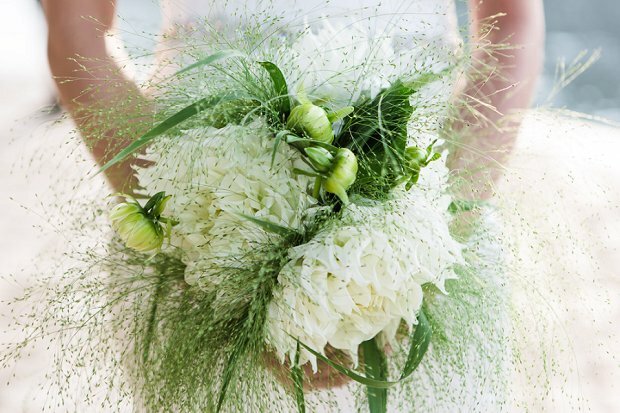 I found some beautiful dahlias and had the shop owner put them together in a bouquet with wispy greenery. I loved them so much. 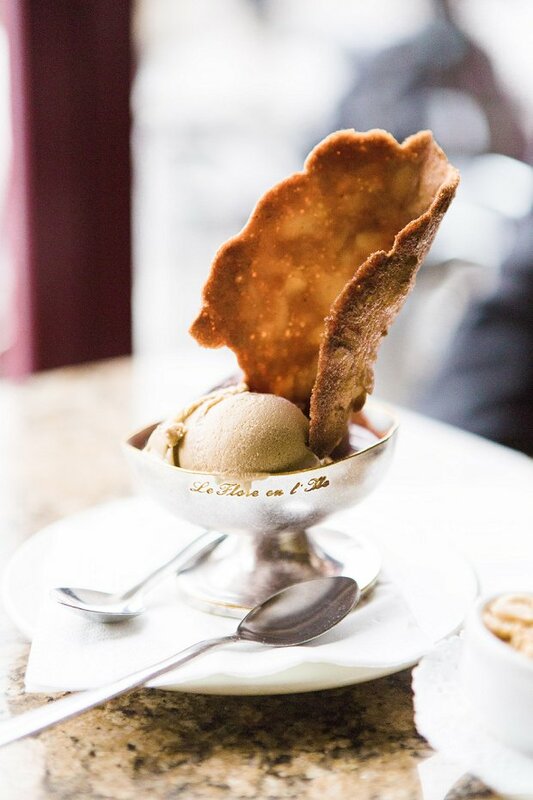 We had some time to kill before our ceremony and Catherine suggested that we pop in a café and grab some berthillon ice cream (famous to Ile Saint Louis). 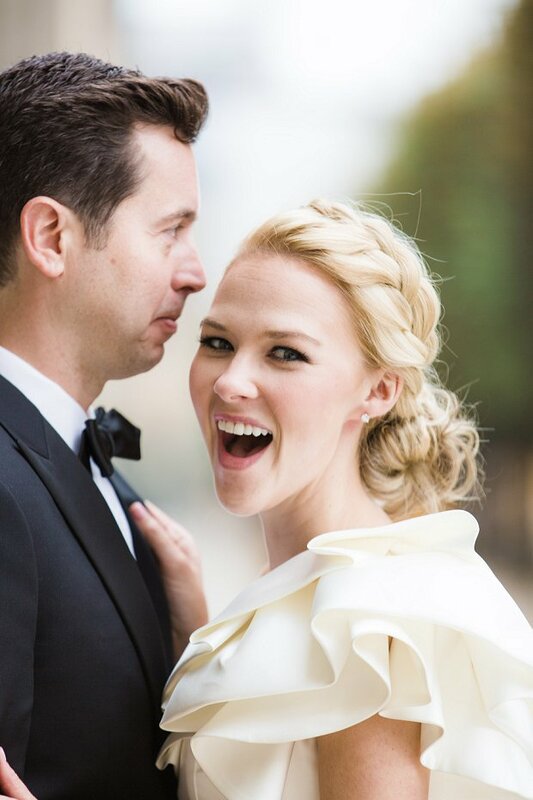 We had ice cream and champagne all decked out in our wedding attire before we said, “I do”. It was fabulous. 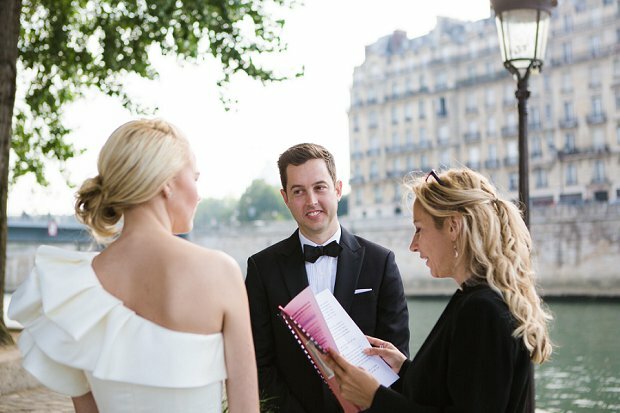 Our wedding celebrant was Aude Abadie and she made our wedding ceremony so special and personalized. She had Josh and I fill out detailed questionnaires and I was shocked with how she turned our answers into beautiful vows. I couldn’t have asked for anything more heartfelt or eloquent. 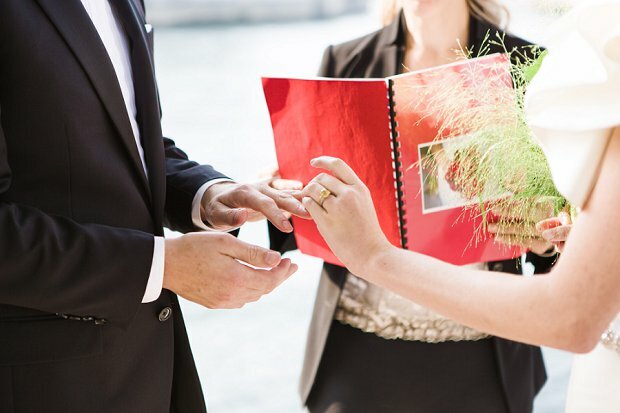 Planning a wedding to take place in another country can be intimidating. But with the internet, especially Pinterest, we didn’t have a problem at all. I came across our photographer through a feature of her previous work and instantly knew I wanted to work with Catherine O’Hara. She was so laid back and easy to work with and she spoke English, which was a plus! She knew all the places to get the essential shots of Paris landmarks and also some unexpected places as well. After our ceremony and pictures around Paris with Catherine, we had dinner at Restaurant Laperouse, one of the city’s oldest restaurants. 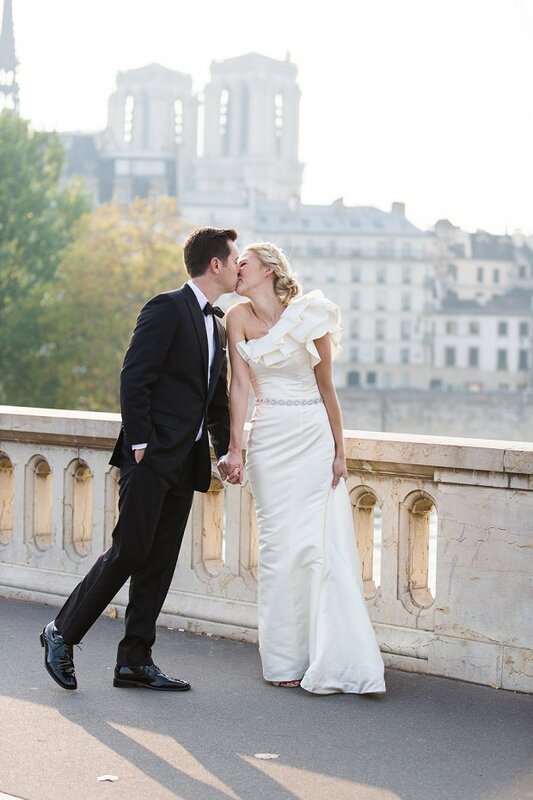 We spent the next few days as newlyweds in Paris before heading off to Italy where we ate and drank our way through Rome. Once we returned to our home in South Carolina, we had a reception with our friends and family to celebrate our wedding. We got to tell everyone about our special day and share pictures from the wedding. We really got the best of both worlds. Be selfish. Do exactly what you want. If it’s a huge wedding with all the bells and whistles, do it. If it’s eloping just the two of you, well, I can’t recommend that option enough! Best decision ever. When we went to the cafe for ice cream in our wedding attire. 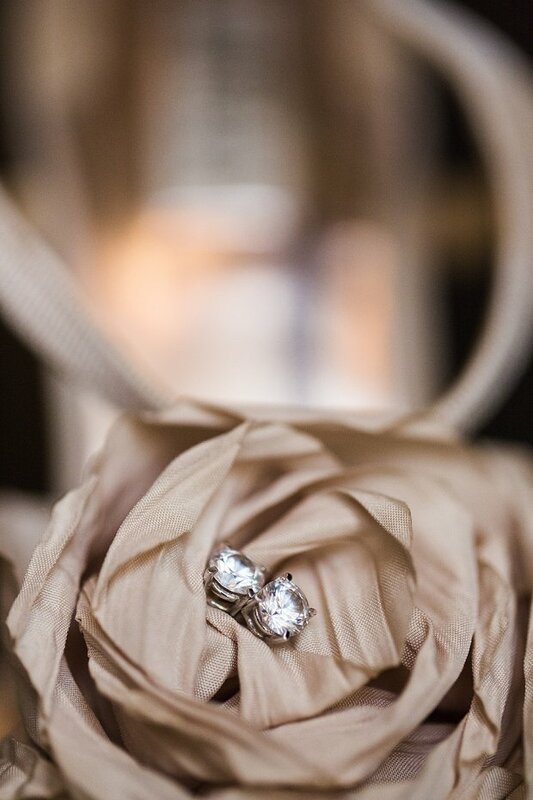 A close second would be after the ceremony, at dusk, watching the Eiffel tower sparkle with my husband. 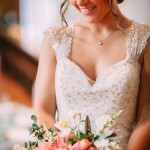 Is this not the sweetest couple and elopement you have ever seen. Vive la France! 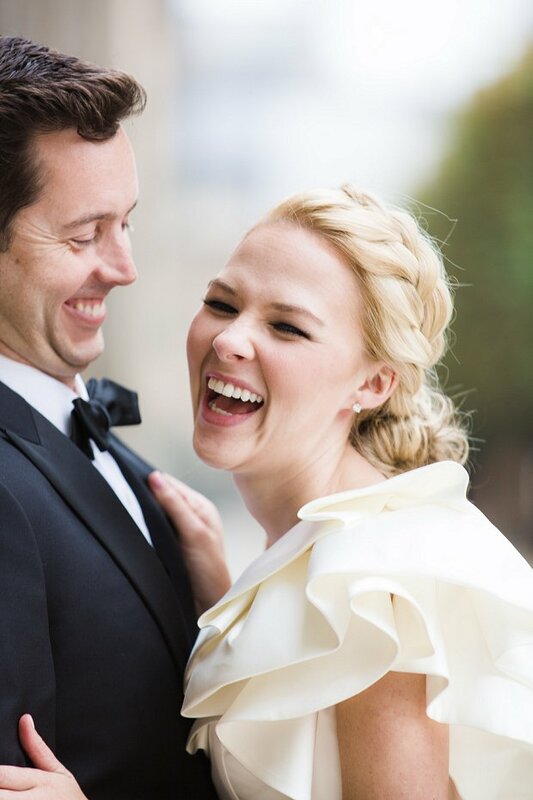 Thanks so much to the wonderful Catherine O’Hara Photography for sharing these stunning images of Josh and Burgess Scott on their big (little) day. Beautiful. 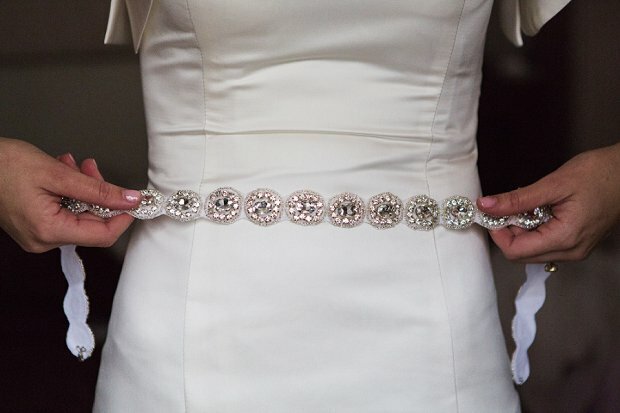 The bride’s dress is so gorgeous. She looks fabulous!